We're not certain how Cambridge Audio squeezed so much performance and great sound into a player at this price, but when it sounds this good, who's asking questions? The CD10's handsome brushed aluminum faceplate is built around a sturdy, all-metal chassis equipped with top-notch hi-fi circuitry. You get a precision transport, dual-sided circuit boards for ultra-short signal paths, and a premium Wolfson digital-to-analog converter (DAC) — all geared to extract every drop of information from your CD library. "From the first disc to the last the CD10 went about its business without a hitch. Tonally neutral but with a slightly forward middle range, it has enough smoothness and detail to make you think you might have stolen something. Some players convey a flatness, perhaps best described as a lack of color or rhythmic energy. 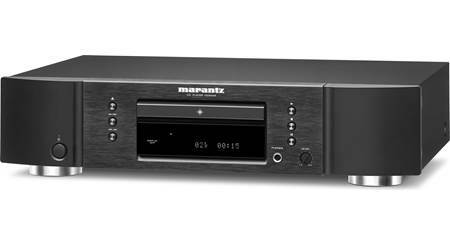 But this player just had an engaging liveliness that kept me focused on the music rather than the clock...the Topaz CD10 is a real standout — a potential MVP". You'll enjoy playback from a variety of discs, ranging from regular CDs to home-burned CD-Rs filled with MP3 and WMA files. The full-function remote gives you command of the basics like "play" and "stop," plus direct track access, repeat, random, and program modes from the comfort of your favorite chair. It can even control other Cambridge Audio components, including the Topaz AM10 integrated amplifier. I see the remote has volume up and down. Are the outputs to this player variable? Can the volume (output level) of the cd player be controlled by the remote? no, sorry. these buttons can operate other Cambridge units. FYI, the sound quality of this player in my opinion is excellent ! jeff. Overview: The Cambridge Audio CD10 compact disc player adheres to three core value principles - stunning performance, ease of use, and incredible value. The Cambridge Audio CD10 features a single front-loading tray and rugged chassis. The CD10 utilizes a Wolfson 8761 DAC and double-sided surface-mounted PCBs for premium sound quality. 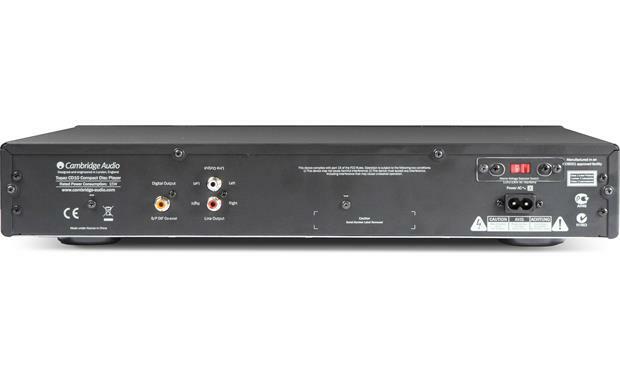 It offers both analog (RCA) and digital (coaxial) outputs. An IR remote is included for wireless operation. Rugged Chassis Design: The Cambridge Audio CD10 compact disc player has been carefully designed with a brushed aluminum front-panel, rigid metal chassis, and dual-layer damped feet to prevent resonance and improve sound quality. Wolfson 8761 DAC: The Cambridge Audio CD10 compact disc player employs a Wolfson Microelectronics WM8761 DAC (digital-to-analog converter) for exceptional audio reproduction. Double-Sided Surface-Mount PCBs: All PCBs (printed circuit boards) use double-sided, full surface mount technology, eliminating wire links and giving ultra-short signal paths for optimum sound quality. Compatible Discs: The Cambridge Audio CD10 compact disc player supports playback of CD-Audio and finalized CD-R or CD-RW discs (8 or 12cm). MP3/WMA Playback: The Cambridge Audio CD10 compact disc player also supports playback of MP3 and WMA music files recorded onto CD-R and CD-RW discs. 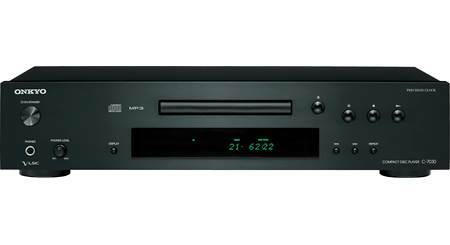 LCD: The Cambridge Audio CD10 compact disc player features a front-panel alphanumeric character LCD which displays CD playback information. When inserting a disc, the CD player will take a few seconds to read the Table of Contents information from the disc. The display will then show the number of tracks on the CD and the total length of the CD. Direct Track Select: Using the supplied IR remote control's numeric keypad you can select a desired track for direct track access. Program: Fully programmable CD playback allows unique sequence of up to 20 tracks from one disc. Skip/Scan: The Cambridge Audio CD player lets you skip (previous/next) between tracks and scan (fast-forward/rewind) within a track. Repeat/Random: The Cambridge Audio CD10 offers both Repeat (one/all) and Random (on/off) playback functions. 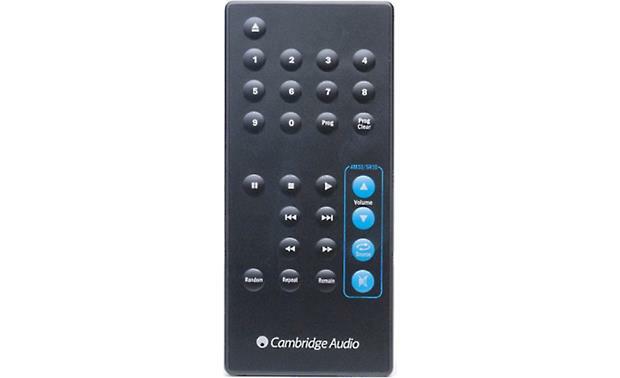 Remote Control: The Cambridge Audio CD10 comes supplied with an IR remote control for wireless operation of the CD player. The IR remote lets you control playback and search functions of the CD player. The remote control also supports volume and source select functions for Cambridge Audio Topaz receivers and integrated amplifiers. Analog Output: The Cambridge Audio CD10 compact disc player features a rear-panel analog stereo RCA output for connecting a home stereo receiver (such as the Cambridge Audio SR10), or integrated amplifier (such as the Cambridge Audio AM10). 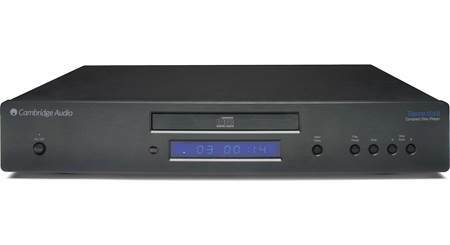 Digital Output: The Cambridge Audio CD10 compact disc player features a rear-panel S/PDIF coaxial digital output for connecting a digital receiver or an external DAC (such as the Cambridge Audio DacMagic, sold separately). Detachable Power Cord: The Cambridge Audio compact disc player includes a detachable 6' AC power cord. Only if you hook it up to powered speakers, if not your AVR remote will control the volume to the front speakers. I've got this player connected to a Marantz amplifier. The up/down volume controls for the CD player do nothing when I press them. The volume is controlled through the amplifier. The other CD player remote buttons (pause, track forward/backward, etc) work fine. Hope this helps. I own the Cambridge Audio Topaz AM10 integrated amplifier and Topaz CD10 CD player. The CD player remote adjusts the volume of the amp. The CD player owner's manual states that the blue colored icon buttons on the remote are used to operate the Topaz AM10 or SR10 units only. These buttons are the volume control, source change and output mute. I personally do not use the CD player remote. The size of the unit and small button configuration makes it awkward to handle. I exclusively use the remote supplied with the amp. It has all the features including CD programming in a comfortable size and fit. This remote appears to have multiple functions outside that of what the Topaz unit has capabilities for. The output on this unit appear to be fixed. I note on the back of the remote shows both a CD10 and RC CD5. Hope this helps. One additional note. The Topaz unit provides excellent playback on factory CD discs; however, on any audio that has been burned or copied to a blank disc, the unit may not be able to read properly. Result may be it may play the first few cuts and freeze up on the start or middle or other cuts. I have found this to be the case on any audio CD's you might burn from your PC. It would have been nice to know this in advance of the purchase. I don't recall what the vol function does, I didn't use those buttons but I don't recommend buying this player. I bought one and it makes a loud snap in the speakers just before playing a track from the STOP mode. I exchanged it for another new one that it did the same thing so it's a bad design. I've read that this CD player can be sensitive with discs that have even the slightest imperfection. I have a lot of older (1980s, 1990s) factory pressed CDs that work fine on my old JVC player. Is it possible the Cambridge player will be too sensitive for my older collection? Almost all my CDs are from the 80s and early 90s and have not had any problems. This is my second Cambridge player. First one lasted many years. I have found this CD player works fine with 80s and 90s compact discs. I have an integra receiver and induction dynamic speakers. It is possible that it will be too sensitive depending on their condition, but I've found this Cambridge player works well. I have approximately 700 factory and CDs. Most were purchased prior to the year 2000. I have never had what would be described as a sensitivity issue with any of the discs. However, I did have problems with the player transport. CDs would sometimes skip, then the player would stop and could not be restarted without powering down. Crutchfield quickly replaced the defective unit and I received full credit for the return. The new unit's transport has also skipped, but only on two occasions. I read many reviews from other owners of this unit. Quite a few described the skipping and stopping of the transport. Unfortunately, further research revealed similar problems with most manufacturers regardless of price point. They just don't build them like they used to. I run the CD player through a Cambridge Audio integrated amplifier. Despite the problems, I am satisfied with the equipment and would purchase Cambridge Audio from Crutchfield again. This IS a standalone unit. It has line (audio) outputs, or a digital out which will connect to your receiver. I am not certain, but I do not believe it will decode HCCD's. Someone else will have to verify that. I do not recommend this player! I had two of them and both had the same audio anomaly. When playing a CD the first selection, whatever track it might be, starts with a loud "SNAP!" in the speakers just before the music starts. I traded them for a Marantz 5005 which I'm also sending back due to a severe malfunction. Doesn't anyone make a decent CD player anymore?...help me Spock! What are the dimensions of this CD player? The CD player is 3" high. 17" wide, and 12" deep. Hope that helps! 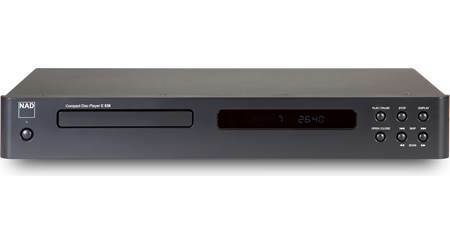 Frank dimensions are 85x430x305mm (3.0x16.9x12.2") Its a great solid CD player with an DAC onboard! Dimensions are: 17" X 12" X3"
frank, the crutchfield page gives the numbers as roughly 17W by 3H by 14 W----it fits into my rack with room to spare. I would definitely recommend the topaz player, which replaced and ancient carver. it sounds good through my old klipsch kg speakers and 2 old apt power amps running dual mono. if you like it simple, I recommend it highly. if you like lots of bells and whistles, get something else. Searches related to the Cambridge Audio Topaz CD10 Single-disc CD player.